Less like a convention and more like a festival, there really is no other event like SFW in the UK. The lack of big-name guests may have deterred some people, but these have always been secondary to the atmosphere. A fantastic geek party by SFW that built upon last year's SFW in the City. Sci-Fi Weekender’s (SFW) annual satellite event, the Sheffield-based SFW in the City, held its second event last weekend. Smaller and more intimate than the main event, SFW in the City still provided a welcome break from the mundanity of everyday life. The venue for the weekend was Sheffield’s o2 Academy, a multi-room affair that provided a central hub with smaller, quieter, rooms available (AKA; the Timeport and the Spaceport). The organisers had obviously assimilated what they had learnt from last year’s SFW in the City, as the space was much better used. Along with greater number of stalls and stands, there was also a retro gaming zone, which offered a great area for chilling out between events. Likewise, many stall-holders had brought portable spotlights to mitigate the venue’s dim lighting. Headlining the event were Tim Rose (the puppeteer of Admiral Ackbar from Star Wars) and Nick Moran (Scabior in Harry Potter), Adrian Rawlins (James Potter in Harry Potter) and Frazer Hines (Jamie MacCrimmon in Doctor Who). Whilst all of these were fun to listen to and offered a glimpse of what happens behind the scenes, none of them could be considered really big names. 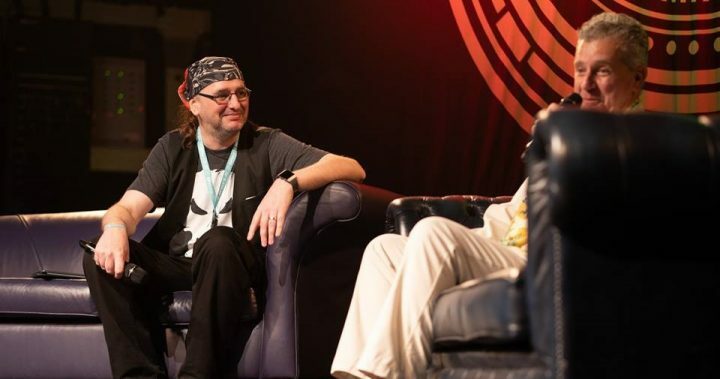 Alongside this were a series of author panels, where writers like Ian Whates, Sam Stone, Bryony Pearce and others discussed the current trends of the publishing world and how it has changed over the years. The authors’ different backgrounds ensured that they each brought a unique perspective to the panels. 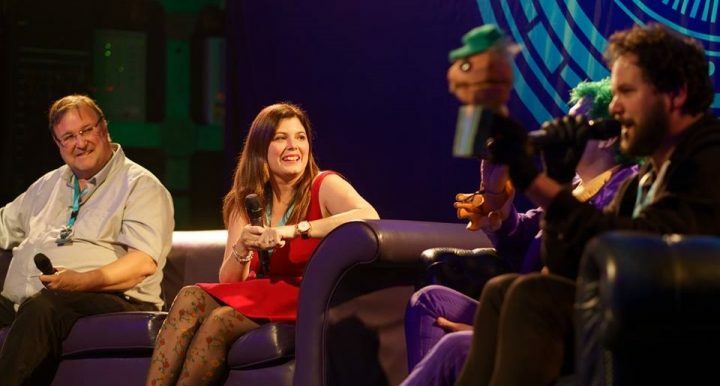 Joining the panels and interviews were a series of performances by Pop-Up Puppet Cinema, where hand puppets re-enact classic films, such as Jaws and Back to the Future. Instead of a faithful retelling, these were pitch-perfect parodies of the films. The fact that these performances often filled the Spaceport indicates how well-received it was. One of best day-time performances on Saturday was Just A Minute, compered by David Howe, where Bryony Pearce and Ian Whates lost to a hand puppet from Pop-Up Puppet Cinema. Sunday’s highlight was undoubtedly the Cosplay Competition. Such competitions can often be drawn-out affairs, but the Jim Credible’s energy and humour whilst compering ensured the contest never dragged. Saturday night was undoubtedly the high-point of the weekend, which opened with the audience participation game FoxDog before leading into the headline act of the night; the Blue Harvest cantina band. The band played a rocking set of science-fiction inspired blues-rock for a wonderfully geeky performance. Saturday night was finished off with a set from the sci-fi DJ Level Up Leroy, who brought a diverse selection of music and never stayed in one genre too long. Whilst the food venue’s food bar offered some a slight increase in the food available, the menu was still comparatively limited. This problem was compounded by the venue’s strict door policy of not allowing any food into the venue. Given that there were several decent pubs and restaurants – including a fantastic Chinese restaurant – all within easy walking distance, this was not as much of a problem as it could have been, but it was an annoyance. If there was to be a criticism aimed at SFW in the City, then it would have to the be lack of A-list guests. However, SFW events have been always been about the atmosphere than the guests. That said, the guests are what first attracts people to a new event. Ultimately, where else would you see Thor stopping an unmarked police car? All photos are by Peter Gatehouse and are used with permission.